Today, computer networks are the core of modern communication. All modern aspects of the public switched telephone network (PSTN) are computer-controlled. Telephony increasingly runs over the Internet Protocol, although not necessarily the public Internet. The scope of communication has increased significantly in the past decade. This boom in communications would not have been possible without the progressively advancing computer network. Computer networks, and the technologies that make communication between networked computers possible, continue to drive computer hardware, software, and peripherals industries. The expansion of related industries is mirrored by growth in the numbers and types of people using networks, from the researcher to the home user. In the late 1950s, early networks of communicating computers included the military radar system Semi-Automatic Ground Environment (SAGE). In 1964, researchers at Dartmouth developed the Dartmouth Time Sharing System for distributed users of large computer systems. The same year, at Massachusetts Institute of Technology, a research group supported by General Electric and Bell Labs used a computer to route and manage telephone connections. Also in 1965, the first widely used telephone switch that implemented true computer control was introduced by Western Electric. In 1969, the University of California at Los Angeles, the Stanford Research Institute, the University of California at Santa Barbara, and the University of Utah were connected as the beginning of the ARPANET network using 50 kbit/s circuits. In 1995, the transmission speed capacity for Ethernet was increased from 10 Mbit/s to 100 Mbit/s. By 1998, Ethernet supported transmission speeds of a Gigabit. The ability of Ethernet to scale easily (such as quickly adapting to support new fiber optic cable speeds) is a contributing factor to its continued use today. A computer network facilitates interpersonal communications allowing people to communicate efficiently and easily via email, instant messaging, chat rooms, telephone, video telephone calls, and video conferencing. Providing access to information on shared storage devices is an important feature of many networks. A network allows sharing of files, data, and other types of information giving authorized users the ability to access information stored on other computers on the network. A network allows sharing of network and computing resources. Users may access and use resources provided by devices on the network, such as printing a document on a shared network printer. Distributed computing uses computing resources across a network to accomplish tasks. A computer network may be used by computer Crackers to deploy computer viruses or computer worms on devices connected to the network, or to prevent these devices from accessing the network (denial of service). A complex computer network may be difficult to set up. It may be costly to set up an effective computer network in a large organization. Most information in computer networks is carried in packets. A network packet is a formatted unit of data (a list of bits or bytes) carried by a packet-switched network. 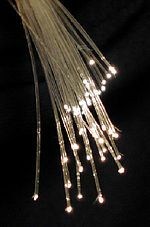 Computer communications links that do not support packets, such as traditional point-to-point telecommunications links, simply transmit data as a bit stream. When data is formatted into packets, the bandwidth of the communication medium can be better shared among users than if the network were circuit switched. A packet consists of two kinds of data: control information and user data (also known as payload). The control information provides data the network needs to deliver the user data, for example: source and destination network addresses, error detection codes, and sequencing information. Typically, control information is found in packet headers and trailers, with payload data in between. 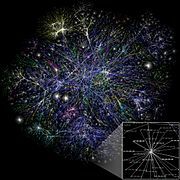 The communication media used to link devices to form a computer network include electrical cable (HomePNA, power line communication, G.hn), optical fiber (fiber-optic communication), and radio waves (wireless networking). In the OSI model, these are defined at layers 1 and 2 — the physical layer and the data link layer. A widely adopted family of communication media used in local area network (LAN) technology is collectively known as Ethernet. The media and protocol standards that enable communication between networked devices over Ethernet are defined by IEEE 802.3. Ethernet transmit data over both copper and fiber cables. Wireless LAN standards (e.g. those defined by IEEE 802.11) use radio waves, or others use infrared signals as a transmission medium. Power line communication uses a building's power cabling to transmit data. Terrestrial microwave – Terrestrial microwave communication uses Earth-based transmitters and receivers resembling satellite dishes. Terrestrial microwaves are in the low-gigahertz range, which limits all communications to line-of-sight. Relay stations are spaced approximately 48 km (30 mi) apart. Extending the Internet to interplanetary dimensions via radio waves. Apart from the physical communications media described above, networks comprise additional basic system building blocks, such as network interface controller (NICs), repeaters, hubs, bridges, switches, routers, modems, and firewalls. A network interface controller (NIC) is computer hardware that provides a computer with the ability to access the transmission media, and has the ability to process low-level network information. For example the NIC may have a connector for accepting a cable, or an aerial for wireless transmission and reception, and the associated circuitry. A repeater is an electronic device that receives a network signal, cleans it of unnecessary noise, and regenerates it. The signal is retransmitted at a higher power level, or to the other side of an obstruction, so that the signal can cover longer distances without degradation. In most twisted pair Ethernet configurations, repeaters are required for cable that runs longer than 100 meters. With fiber optics, repeaters can be tens or even hundreds of kilometers apart. A repeater with multiple ports is known as a hub. Repeaters work on the physical layer of the OSI model. Repeaters require a small amount of time to regenerate the signal. This can cause a propagation delay that affects network performance. As a result, many network architectures limit the number of repeaters that can be used in a row, e.g., the Ethernet 5-4-3 rule. Hubs have been mostly obsoleted by modern switches; but repeaters are used for long distance links, notably undersea cabling. A network switch is a device that forwards and filters OSI layer 2 datagrams between ports based on the MAC addresses in the packets. A switch is distinct from a hub in that it only forwards the frames to the physical ports involved in the communication rather than all ports connected. It can be thought of as a multi-port bridge. It learns to associate physical ports to MAC addresses by examining the source addresses of received frames. If an unknown destination is targeted, the switch broadcasts to all ports but the source. Switches normally have numerous ports, facilitating a star topology for devices, and cascading additional switches. Modems (MOdulator-DEModulator) are used to connect network nodes via wire not originally designed for digital network traffic, or for wireless. To do this one or more frequencies are modulated by the digital signal to produce an analog signal that can be tailored to give the required properties for transmission. Modems are commonly used for telephone lines, using a Digital Subscriber Line technology. A bus network: all nodes are connected to a common medium along this medium. This was the layout used in the original Ethernet, called 10BASE5 and 10BASE2. The most striking example of an overlay network is the Internet itself. The Internet itself was initially built as an overlay on the telephone network. Even today, at the network layer, each node can reach any other by a direct connection to the desired IP address, thereby creating a fully connected network. The underlying network, however, is composed of a mesh-like interconnect of sub-networks of varying topologies (and technologies). Address resolution and routing are the means that allow mapping of a fully connected IP overlay network to its underlying network. A communications protocol is a set of rules for exchanging information over network links. In a protocol stack (also see the OSI model), each protocol leverages the services of the protocol below it. An important example of a protocol stack is HTTP running over TCP over IP over IEEE 802.11. (TCP and IP are members of the Internet Protocol Suite. IEEE 802.11 is a member of the Ethernet protocol suite.) This stack is used between the wireless router and the home user's personal computer when the user is surfing the web. Whilst the use of protocol layering is today ubiquitous across the field of computer networking, it has been historically criticized by many researchers for two principle reasons. Firstly, abstracting the protocol stack in this way may cause a higher layer to duplicate functionality of a lower layer, a prime example being error recovery on both a per-link basis and an end-to-end basis. Secondly, it is common that a protocol implementation at one layer may require data, state or addressing information that is only present at another layer, thus defeating the point of separating the layers in the first place. For example, TCP uses the ECN field in the IPv4 header as an indication of congestion; IP is a network layer protocol whereas TCP is a transport layer protocol. Ethernet is a family of protocols used in LANs, described by a set of standards together called IEEE 802 published by the Institute of Electrical and Electronics Engineers. It has a flat addressing scheme. It operates mostly at levels 1 and 2 of the OSI model. For home users today, the most well-known member of this protocol family is IEEE 802.11, otherwise known as Wireless LAN (WLAN). The complete IEEE 802 protocol suite provides a diverse set of networking capabilities. For example, MAC bridging (IEEE 802.1D) deals with the routing of Ethernet packets using a Spanning Tree Protocol, IEEE 802.1Q describes VLANs, and IEEE 802.1X defines a port-based Network Access Control protocol, which forms the basis for the authentication mechanisms used in VLANs (but it is also found in WLANs) – it is what the home user sees when the user has to enter a "wireless access key". While the role of ATM is diminishing in favor of next-generation networks, it still plays a role in the last mile, which is the connection between an Internet service provider and the home user. For an interesting write-up of the technologies involved, including the deep stacking of communications protocols used, see. A LAN is depicted in the accompanying diagram. All interconnected devices use the network layer (layer 3) to handle multiple subnets (represented by different colors). Those inside the library have 10/100 Mbit/s Ethernet connections to the user device and a Gigabit Ethernet connection to the central router. They could be called Layer 3 switches, because they only have Ethernet interfaces and support the Internet Protocol. It might be more correct to call them access routers, where the router at the top is a distribution router that connects to the Internet and to the academic networks' customer access routers. The defining characteristics of a LAN, in contrast to a wide area network (WAN), include higher data transfer rates, limited geographic range, and lack of reliance on leased lines to provide connectivity. Current Ethernet or other IEEE 802.3 LAN technologies operate at data transfer rates up to 10 Gbit/s. The IEEE investigates the standardization of 40 and 100 Gbit/s rates. 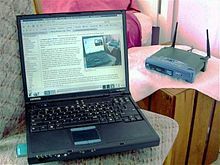 A LAN can be connected to a WAN using a router. A storage area network (SAN) is a dedicated network that provides access to consolidated, block level data storage. SANs are primarily used to make storage devices, such as disk arrays, tape libraries, and optical jukeboxes, accessible to servers so that the devices appear like locally attached devices to the operating system. A SAN typically has its own network of storage devices that are generally not accessible through the local area network by other devices. The cost and complexity of SANs dropped in the early 2000s to levels allowing wider adoption across both enterprise and small to medium sized business environments. Routing calculates good paths through a network for information to take. For example from node 1 to node 6 the best routes are likely to be 1-8-7-6 or 1-8-10-6, as this has the thickest routes. In packet switched networks, routing directs packet forwarding (the transit of logically addressed network packets from their source toward their ultimate destination) through intermediate nodes. Intermediate nodes are typically network hardware devices such as routers, bridges, gateways, firewalls, or switches. General-purpose computers can also forward packets and perform routing, though they are not specialized hardware and may suffer from limited performance. The routing process usually directs forwarding on the basis of routing tables, which maintain a record of the routes to various network destinations. Thus, constructing routing tables, which are held in the router's memory, is very important for efficient routing. Most routing algorithms use only one network path at a time. Multipath routing techniques enable the use of multiple alternative paths. Modern networks use congestion control and congestion avoidance techniques to try to avoid congestion collapse. These include: exponential backoff in protocols such as 802.11's CSMA/CA and the original Ethernet, window reduction in TCP, and fair queueing in devices such as routers. Another method to avoid the negative effects of network congestion is implementing priority schemes, so that some packets are transmitted with higher priority than others. Priority schemes do not solve network congestion by themselves, but they help to alleviate the effects of congestion for some services. An example of this is 802.1p. A third method to avoid network congestion is the explicit allocation of network resources to specific flows. One example of this is the use of Contention-Free Transmission Opportunities (CFTXOPs) in the ITU-T G.hn standard, which provides high-speed (up to 1 Gbit/s) Local area networking over existing home wires (power lines, phone lines and coaxial cables). For the Internet RFC 2914 addresses the subject of congestion control in detail. Examples of end-to-end encryption include PGP for email, OTR for instant messaging, ZRTP for telephony, and TETRA for radio. Typical server-based communications systems do not include end-to-end encryption. These systems can only guarantee protection of communications between clients and servers, not between the communicating parties themselves. Examples of non-E2EE systems are Google Talk, Yahoo Messenger, Facebook, and Dropbox. Some such systems, for example LavaBit and SecretInk, have even described themselves as offering "end-to-end" encryption when they do not. Some systems that normally offer end-to-end encryption have turned out to contain a back door that subverts negotiation of the encryption key between the communicating parties, for example Skype. Network administrators can see networks from both physical and logical perspectives. The physical perspective involves geographic locations, physical cabling, and the network elements (e.g., routers, bridges and application layer gateways) that interconnect the physical media. Logical networks, called, in the TCP/IP architecture, subnets, map onto one or more physical media. For example, a common practice in a campus of buildings is to make a set of LAN cables in each building appear to be a common subnet, using virtual LAN (VLAN) technology. ^ Ethernet: Distributed Packet Switching for Local Computer Networks, Robert M. Metcalfe and David R. Boggs, Communications of the ACM (pp 395–404, Vol. 19, No. 5), July 1976. ^ "Define switch.". WWW.Wikipedia.com. Retrieved April 8, 2008. ^ "End System Multicast". project web site. Carnegie Mellon University. Retrieved May 25, 2013. ^ Wakeman, I (Jan 1992). "Layering considered harmful". IEEE Network: pp. 20–24. ^ Martin, Thomas. "Design Principles for DSL-Based Access Solutions". Retrieved 18 June 2011. ^ "personal area network (PAN)". Retrieved January 29, 2011. ^ "Mobile Broadband Wireless connections (MBWA)". Retrieved 2011-11-12. ^ Mansfield-Devine, Steve (December 2009). "Darknets". Computer Fraud & Security 2009 (12): 4–6. doi:10.1016/S1361-3723(09)70150-2. ^ Wood, Jessica (2010). "The Darknet: A Digital Copyright Revolution". Richmond Journal of Law and Technology 16 (4). Retrieved 25 October 2011. ^ "State Transition Diagrams". Retrieved July 13, 2003. ^ "Bigger Monster, Weaker Chains: The Growth of an American Surveillance Society". American Civil Liberties Union. January 15, 2003. Retrieved March 13, 2009. This page was last modified on 19 August 2014 at 19:58.